As readers of The Apology know, Christian’s experience as a veteran is an intricate part of his character while in Vietnam with Nachi and Hai. With Veterans Day this week, I’m teaming up with my friends, Steve and Trisha Castraberti, for a book signing fundraiser on November 10th from 6:00PM – 9:00PM at their restaurant, Prince Pizzeria, in Saugus. The proceeds from each book bought now and through the end of Veterans Day on November 11th will be matched by myself and Emily, up to $1,000. We are already more than halfway to this goal! All funds raised will benefit local disabled veterans through the Massachusetts Elks Association in support of the Disabled Veterans Service Committee. 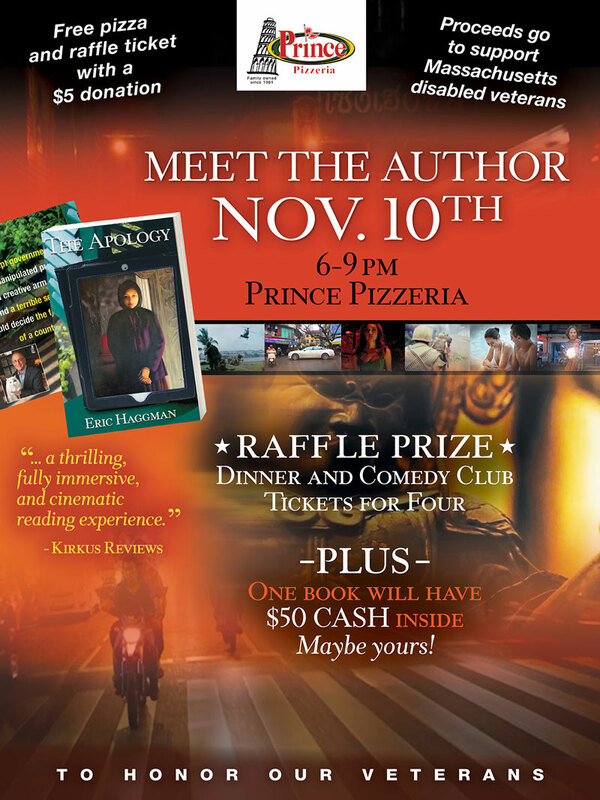 On November 10th, any military person that joins the book signing event will receive a free book (must be dressed in military uniform or show a military ID). There will be free pizza generously provided by Steve and Trisha with the purchase of a book or donation. We’ll also be giving away dinner for four at Prince Pizzeria and tickets to a comedy show at Giggles Comedy Club scheduled for a later date. Prince Pizzeria is located at 517 Broadway (Rt. 1) in Saugus, MA. We can’t wait to see you on Thursday!